Energy: One Lump or Two? Groundhog Day is just a few weeks off, which means it’s time for another post about . . . energy. What did environmentalists get in their Christmas stockings from Santa? A big lump of coal. More than one lump in fact. If the world’s energy mix were analogized to getting a cup of coffee at Starbucks, we’d see everyone getting two lumps in their latte. There’s no doubt that the unexpected abundance of cheap natural gas combined with the EPA’s lawless drive to exterminate coal—still the leading source of electric power in the US—is taking a fearsome toll on America’s coal industry. 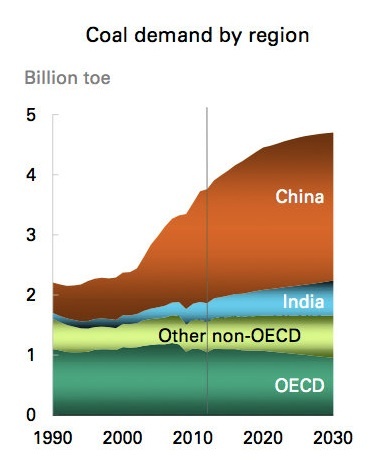 But if you draw back a bit and take a look around the world, what you find is that the fastest growing source of energy continues to be: Coal. China approved the construction of more than 100 million tonnes of new coal production capacity in 2013 – six times more than a year earlier and equal to 10 percent of U.S. annual usage – flying in the face of plans to tackle choking air pollution. The scale of the increase, which only includes major mines, reflects Beijing’s aim to put 860 million tonnes of new coal production capacity into operation over the five years to 2015, more than the entire annual output of India. Well, okay, that’s China, a still-developing country that wants to get rich before it cleans up. Surely no advanced, enlightened country, like, say solar- and wind-loving Germany, would do such a thing. Oops. The story isn’t working out so well. Germany’s wind and solar power production came to an almost complete standstill in early December. More than 23,000 wind turbines stood still. One million photovoltaic systems stopped work nearly completely. 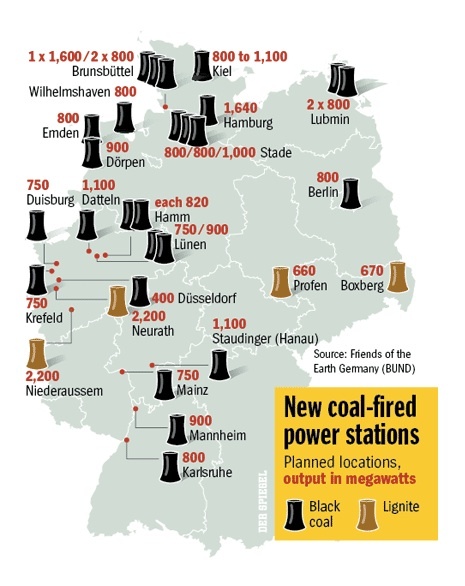 For a whole week coal, nuclear and gas power plants had to generate an estimated 95 percent of Germany’s electricity supply. Germany’s energy transition has also been a transition to coal: Despite multi-billion subsidies for renewable energy sources, power generation from brown coal (lignite) has climbed to its highest level in Germany since 1990. It is especially coal-fired power plants that are replacing the eight nuclear power plants that were shut down, while less CO2-intensive, but more expensive gas-fired power plants are currently barely competitive. Energy expert Patrick Graichen speaks of Germany’s “energy transition paradox”: the development of solar and wind farms, yet rising carbon dioxide-emissions. The projects go against the grain of European Union rules limiting emissions and pushing cleaner energy. Alarmed at power prices about double U.S. levels, policy makers are allowing the expansion of coal mines that were scaled back in the past two decades, stirring a backlash in the targeted communities. Coal remains the biggest source of fuel for generating electricity in the U.S. and coal exports are growing fast. Demand is being stoked by the rise of power-hungry middle classes in emerging economies, led by China and India. By the end of this decade, coal is expected to surpass oil as the world’s dominant fuel source, according to a recent study by consultant Wood Mackenzie. This is what happens reality intrudes on green dreams. The greens better get used to taking their (coal) lumps. Coming tomorrow: a review of the best energy book of the year—perhaps of the decade. Stay tuned. . .